Jeff VanderMeer's Southern Reach trilogy led us on a gradual descent into creeping sci-fi horror. His new standalone novel Borne plunges you straight-off into a post-apocalyptic cityscape picked over by scavengers, failed biotech, and a Godzilla-sized flying bear called Mord. 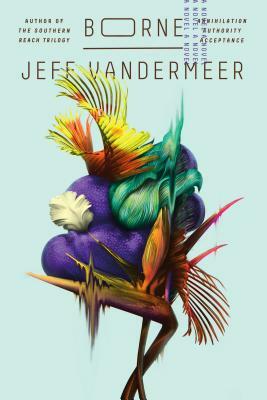 The world VanderMeer describes is terrifying and ingeniously conceived, but it's the relationship between a scavenger, Rachel, and the squid-like biotech creature she names Borne that is the book's most remarkable feat. "He was born, but I had borne him...."
“Am I a person?” Borne asked me. In Borne, a young woman named Rachel survives as a scavenger in a ruined city half destroyed by drought and conflict. The city is dangerous, littered with discarded experiments from the Company—a biotech firm now derelict—and punished by the unpredictable predations of a giant bear. Rachel ekes out an existence in the shelter of a run-down sanctuary she shares with her partner, Wick, who deals his own homegrown psychoactive biotech. One day, Rachel finds Borne during a scavenging mission and takes him home. Borne as salvage is little more than a green lump—plant or animal?—but exudes a strange charisma. Borne reminds Rachel of the marine life from the island nation of her birth, now lost to rising seas. There is an attachment she resents: in this world any weakness can kill you. Yet, against her instincts—and definitely against Wick’s wishes—Rachel keeps Borne. She cannot help herself. Borne, learning to speak, learning about the world, is fun to be with, and in a world so broken that innocence is a precious thing. For Borne makes Rachel see beauty in the desolation around her. She begins to feel a protectiveness she can ill afford. But as Borne grows, he begins to threaten the balance of power in the city and to put the security of her sanctuary with Wick at risk. For the Company, it seems, may not be truly dead, and new enemies are creeping in. What Borne will lay bare to Rachel as he changes is how precarious her existence has been, and how dependent on subterfuge and secrets. In the aftermath, nothing may ever be the same.